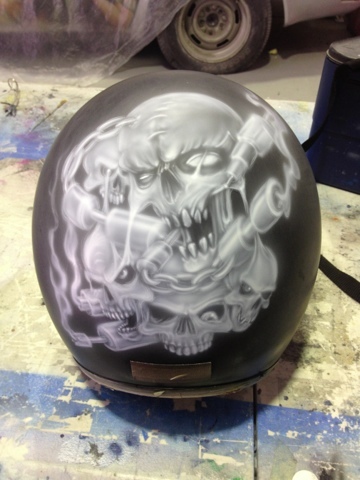 Harley helmet completed @ Advanced Airbrush, Sydney. 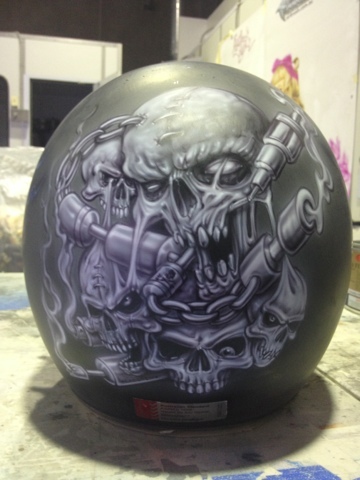 It was a great few days spent working on a Harley Helmet at Advanced Airbrush in Sydney. 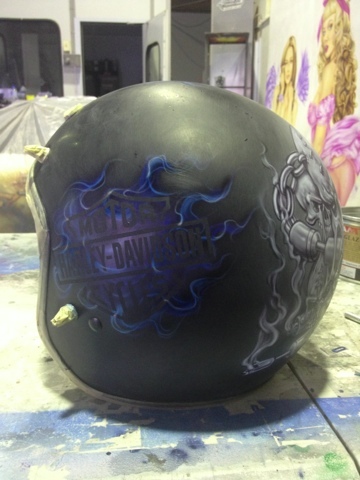 The helmet shown here was completed in just over a day and will now be clear coated, ready to be auctioned for Fraser Motorcycles with the proceeds going to the Starlight Foundation. We had a fantastic time working with Wayne and Joanne Harrison and the team @ Advanced Airbrush and we are looking forward to coming back to work with them again soon. Today we are on our way to Bondi to check out the beach and do the Bondi to Coogee walk, the weather is perfect and its a nice change to be away from the freezing weather of Melbourne. Tomorrow, we head to Penrith to spend a few days working with Wayne and Joanne Harrison from Advanced Airbrush, Flesh Air, we are excited to work with them on some exciting airbrush projects. We will also be taking a trip to visit Anest Iwata to check out our order of airbrushes, stencils and other products for the commencement of our upcoming Airbrush Course, starting Monday the 9th September. 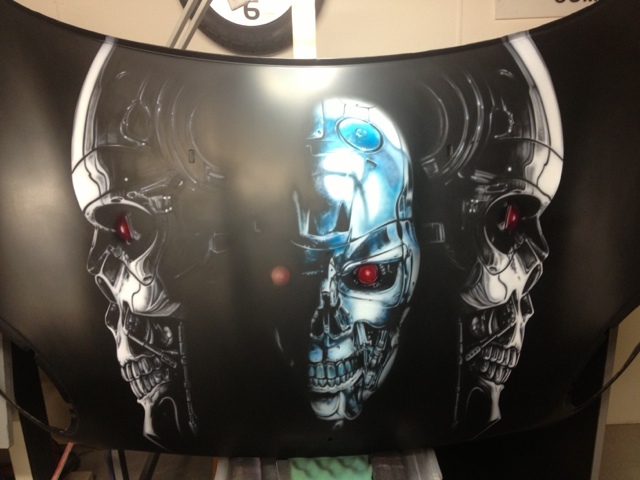 We were recently asked to complete a theme on a Mini Cooper bonnet / hood. 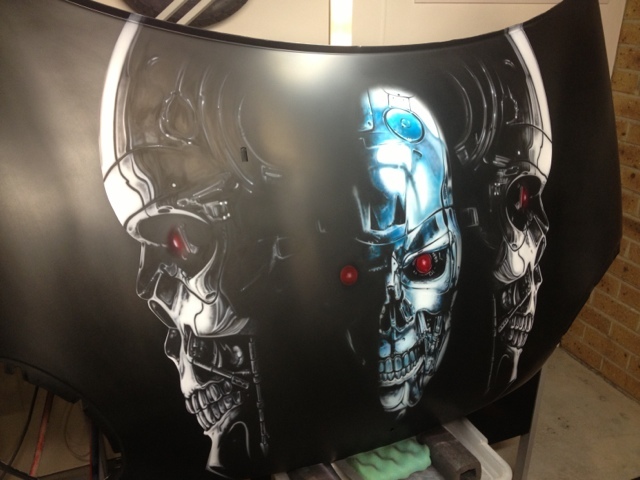 Years ago we completed an artwork from T3 rise of the machines and that bonnet still gets plenty of comments and praise. 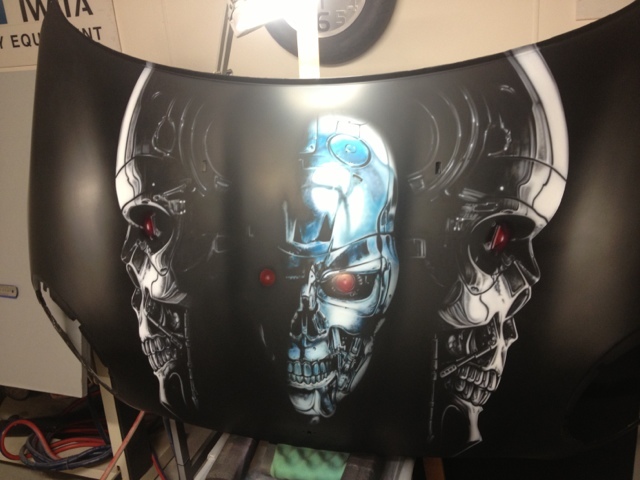 Loving the movies and enjoying painting this style of artwork, we decided to layout some terminator artwork to suit the shape of the bonnet and to showcase the detail and reflections of the terminator skulls.